The reason plastic is awesome is that it's super durable, so it lasts forever, which is an issue when we want it to go away and take its place in the circle life. 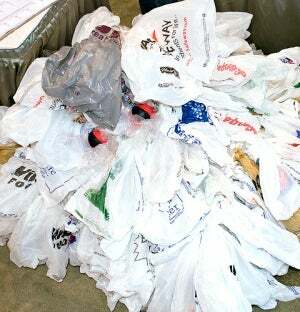 Biodegradable plastics aren't new, but in the past they've been pretty weak and expensive. Eco-geeks at the Missouri University of Science and Technology have come up with the anti-daywalker of plastic: All of its strengths, but it disintegrates in four months. They've got different plastic polymer cocktails depending on use—one for water bottles, another for grocery sacks—with varying bio-based fillers that'll break down easier. One possible filler is glycerol, which is a waste product of making biodiesel. Another is polylactic acid, which is made by fermenting starches, and breaks down in just 60 days—it's a possible candidate for water bottle plastics. The bio-based fillers in the polymers will make it cheaper than past biogradegradables, but still fairly strong.